Last month [May 2014], for the first time in history, the non-English downloads of WordPress passed the English downloads. 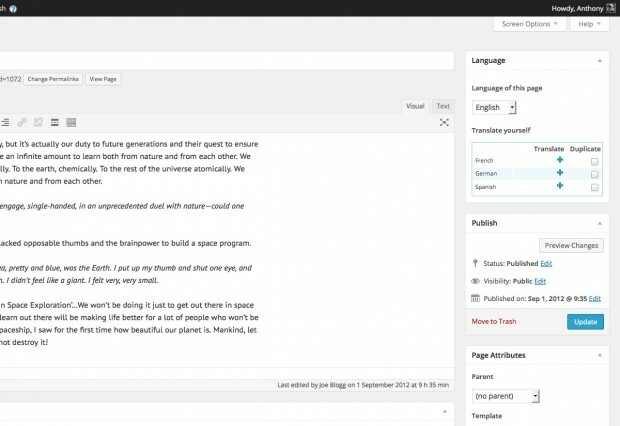 In the future, if we do our job right, the usage of WordPress will democratise publishing. It will resemble every language in the world. With the release of WordPress 4.0, one of the key features is the ability to select your language when you’re installing WordPress. 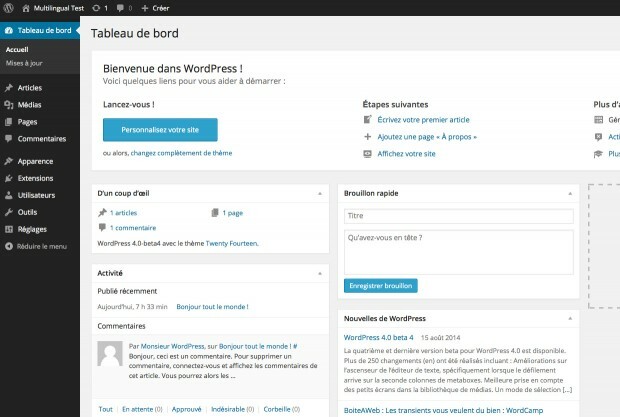 When you do this, WordPress will automatically download and install the appropriate language pack so that your Dashboard will appear in your selected langauge. The most basic translation function. Returns the text in the correct language. The same as __() except it echoes the text instead of returning the value. Return the plural or single form based on the $number. Used when there’s the chance the text could be found in more than two places, but with different context. Allows you to provide a short description to clarify the text being translated. The same as _x() except it echoes the text instead of returning the value. A hybrid of _n() and _x(). It supports contexts and plurals. After activating the WPML plugin, the first step is to configure it. WPML steps you through this simple 3-step process. After configuring WPML, the next step is to add your content. Thankfully, WPML makes this process fairly painless. 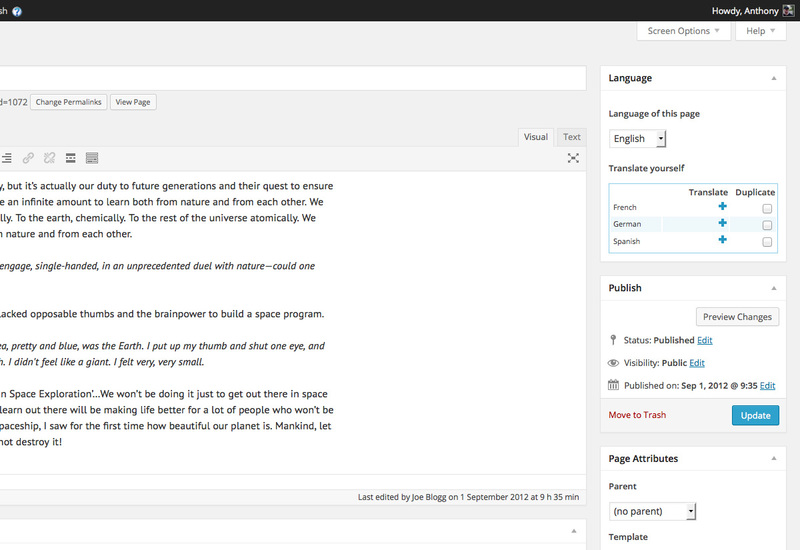 When editing your content, you’re presented with a new Language Panel on the right-hand side of the edit screen. 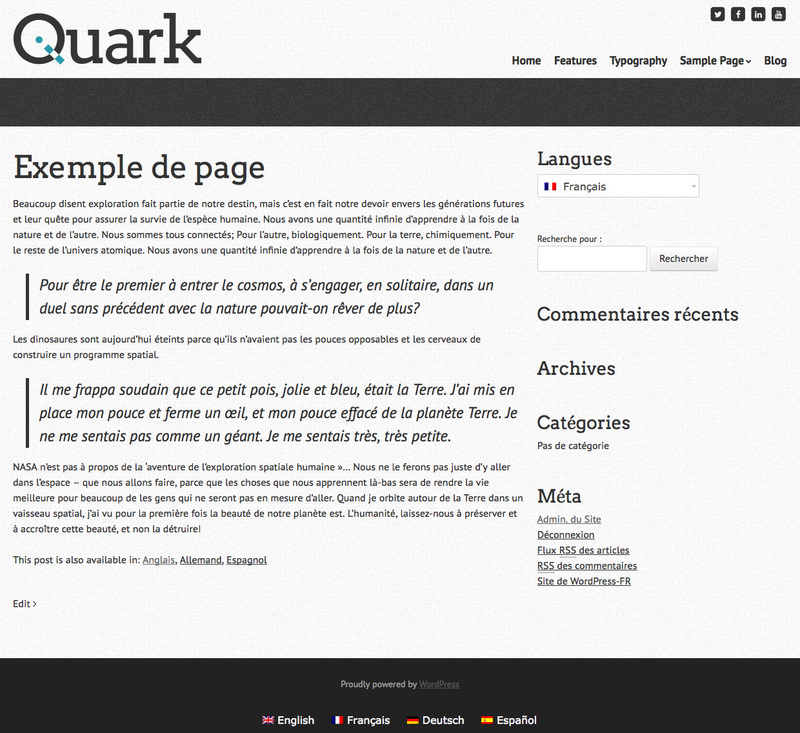 Within the Language Panel you can view what languages the current page has been translated into. You can either switch to one of your translated pages or if need be, create a new page for your translation. 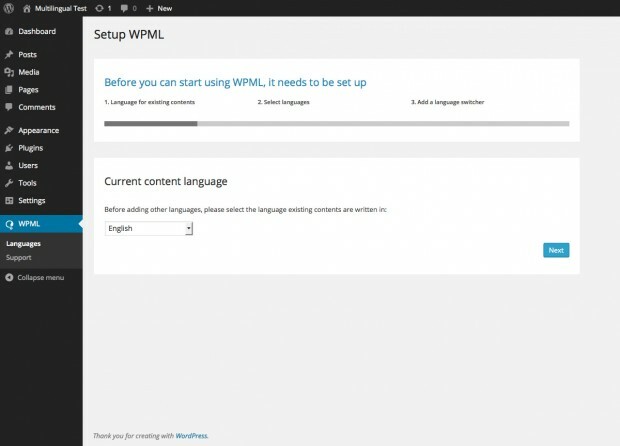 When you view your list of Pages (or Posts) within the Dashboard, WPML makes it easy to see what content has been translated and what hasn’t. Clicking on the small plus symbol allows you to add a new page for translation while clicking the pencil icon will take you directly to the edit page for that specific language. View what content has been translated and what hasn’t. 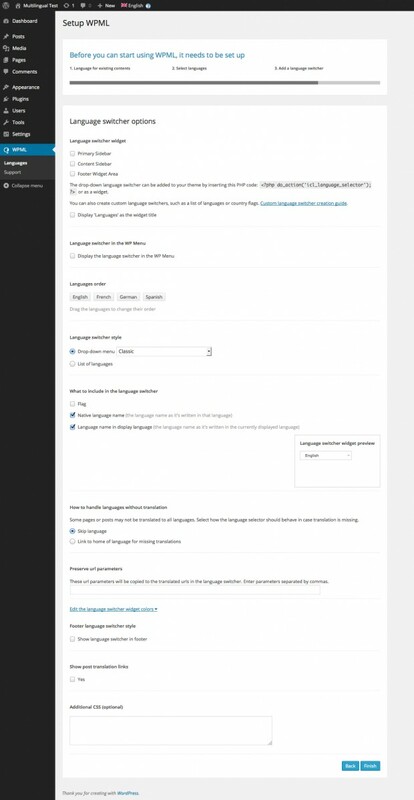 Once your content has been translated, your visitors will be able to change languages using the various ‘Language Switchers’ that WPML provide. You can have language switchers in the menu, sidebar, below the content and in the footer. You can also add them anywhere in your templates by adding the relevant PHP code. You can also translate your WordPress menus, Widgets and custom Post types, among other things. This should give the basics for setting up a multilingual site. If you’d like like some more information on making your themes translatable or setting up a multilingual site, then check out the links below. Also, don’t forget to check out my presentation on Slideshare. You can view the slides below or over on Slideshare. Thanks for the quick tour of WPML Anthony! I’m curious to know how the data is saved – as separate posts or as post meta? And what happens when you deactivate the plugin? Hi David! Good question! The content is saved as separate data, in the Posts table. There are also a number of tables that WPML creates which it uses as well, to manage the various languages. The WPML site has a good page that provides some further information on their WPML specific tables. It’s quite good the way it works, as you can see in the screenshot above, when you view your list of Pages (or Posts), you only see the English (or default language) version of the page, even though the content is still stored in the Posts table. If you disable the plugin though, the translated content will then appear in the page list. And obviously, since the translated content is still in the database in the Posts table, you can still access it if you know the URL.